From Empty Practice to Meaning-Full and Spirit-Full Prayers and Rituals . . . in Seven Simple Steps! From Empty Practice cover Do your prayers or rituals seem lacking? Despite your spiritual practice, do you seem to never feel a direct connection with the Divine? Does your religious observance leave you looking for something more? If so, take heart. 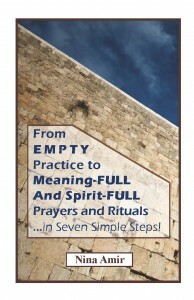 Seven simple steps can help you make your empty rituals, prayers and practices meaning-full and spirit-full. Outlined simply in this booklet written by Nina Amir, these steps are likened to the process of inviting a special guest to dinner. They include: Spiritual Preparation, The Sacred Place Setting, Creating the Meal, The Divine Invitation, The Finishing Touch, Welcoming Your Guest, and Enjoying the Company. In addition, the brochure offers three tips to help you create a spiritual experience.